This celebration of the Class of 2019 is a wonderful way to learn about the Out In Front program and how we help strengthen skills of amazing LGBTQ Leaders. Bringing a sense of joy and empowerment to the Snohomish County LGBTQ+ community through celebration and collaboration. 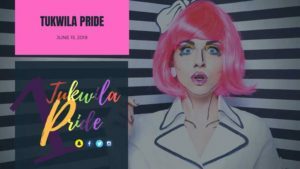 Tukwila Pride is an LGBTQ community celebration. It will be a day filled with Music, Booths, Food and so much more. Join us for the 1st Annual Event.